Your HP 940 cw prints beautiful photos, but how are your ink levels? Undoubtedly your HP 940cw will polish off its printer ink, and when it happens you'll soon realise that buying HP 940cw ink can be really expensive. You don't have to lose sleep about paying the steep asking prices you'll uncover on the main street because right here at Cartridge Save you can find all the HP 940 cw cartridges you will ever want at really low prices. Start to save cash on your ink by ordering online at Cartridge Save! Don't waste your money buying your 940-cw original cartridge or 940cw compatible ink down the main street when it is easy to save a handful of money shopping online with Cartridge Save. Have perfect satisfaction when you order your DeskJet 940cw ink cartridges from us as each one is protected by a quibble-free money back guarantee. Don't forget to take into consideration that every single purchase comes with free delivery, normally delivered to your door on the next working day! This budget-friendly and no-frills printer is aimed at users that need a personal printer for printing photos and documents using a variety of media. The Hewlett Packard Deskjet 940cw colour inkjet printer is fairly fast and delivers quality text printouts. However, the HP Deskjet 940cw is not the best choice for printing photos. On the right-hand top corner of the HP Deskjet 940cw's panel are 4 indicator lights and 3 buttons, while the lower centre part is home to the 150-sheet paper tray. The HP Deskjet 940cw printer relies on USB and parallel connections, so installing it is easy. There is 2MB of built-in RAM, while technologies like PhotoREt III colour layering is good for printing high-resolution colour photos at up to 2400x1200dpi. The Deskjet 940cw inkjet printer is an improvement from its predecessors when it comes to speed. The maximum for black text is 12 ppm, while full-page colour printouts are ready in 3ppm. Different sizes of media at up to 8.5x14 inches are supported by this printer, making it versatile for different projects including labels, transparencies, and banners. 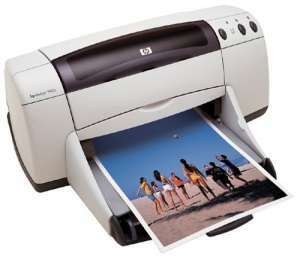 The HP Deskjet 940cw is compatible with Windows XP and the plug-and-play interface makes it easy to use. The sparse documentation of the HP Deskjet 940cw can be a hassle for users with no time to go online to download a longer and more detailed manual. The HP 940cw inkjet printer is still prone to errors in cartridge alignment, which may overwhelm first-time users. Dithering on pictures printed on glossy media cause obvious grainy details. Apart from these issues, the HP Deskjet 940cw is not network-ready, and warranty is only good for 90 days.